The bearded Christ, wearing the torse and naked but for the loincloth, is on the cross in the centre of the panel, with his head inclined to the left. Figures of the Virgin Mary and the other two Marys together with St John the Evanglist and Longinus are shown on either side of the cross. Angels are represented holding chalices to catch Christ's blood. 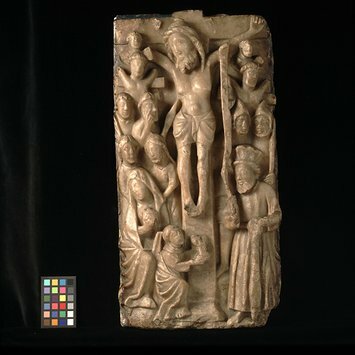 The bearded Christ, wearing the torse and naked but for the loincloth, is on the cross in the centre of the panel, his head inclined to the left. An angel kneels at the foot of the cross on the left holding a chalice beneath Christ's feet to catch the precious blood. Two other angels are positioned beneath Christ's hands with chalices. The Virgin sits on the left of the panel, her head turned away from her Son. Behind her stand Mary Magdalene and Mary Cleophas. Behind them are the beardless St. John the Evangelist, holding a palm, and Longinus, touching his eye with his right hand and pointing his spear at the wound in Christ's side. On the right of the panel stands the bearded centurion, wearing a high-crowned hat and long, belted gown. He rests his left hand on a staff. From his right a scroll ascends to Christ's left arm which doubtless originally bore the inscription: 'Vere Filius Dei erat iste.' Behind the centurion stand two soldiers wearing basinets, one with a spear in his left hand. On either side of Christ are the two thieves, arms over the top of their crosses. The unrepentant theif, on Christ's left, is bearded. The surface of the panel is badly worn. Christ's feet are damaged and his right hand is missing. The top left corner has been repaired with plaster. The top and bottom corners on the right are chipped. There are faint traces of gilding on Christ's hair and beard. There are three lead-plugged holes in the back of the panel. The bottom has been cut away. Acquired by Dr W. L. Hildburgh in San Sebastián, Spain, and formerly in a collection in Castile. On loan from Dr Hildburgh since 1920 and given by him in 1946. Alabaster panel depicting the Crucifixion. English, late 15th century.